Whether he's breaking into an impregnable fortress, fighting pirates, or striking the final blow in political war, Ahren is the man for the job. After being framed for murder, his reward posters have named him The Black Raven. In order to survive, Ahren finds himself drafted into the Tyenee, a secret criminal organization whose influence stretches across the world. Their missions are the most daring and most dangerous, and the penalty for failure...is death. Matt Hollis is the current wielder of the holy weapon, DÄMOREN. With it, he stalks and destroys demons. A secret society called the VALDUCANS has taken an interest in Matt's activities. They see him as a reckless rogue - little more than a "cowboy" corrupted by a monster - and a potential threat to their ancient order. As knights and their sentient weapons begin dying, Matt teams up with other hunters of his kind such as LUIZA, a woman with a conquistador blade; ALLAN, an Englishman with an Egyptian khopesh; MALCOLM, a voodoo priest with a sanctified machete; and TAKAIRA, a naginata-swinging Samurai. As the hunters become the hunted, they must learn to trust one another before a powerful demonic entity thrusts the world into a terrible and ageless darkness. 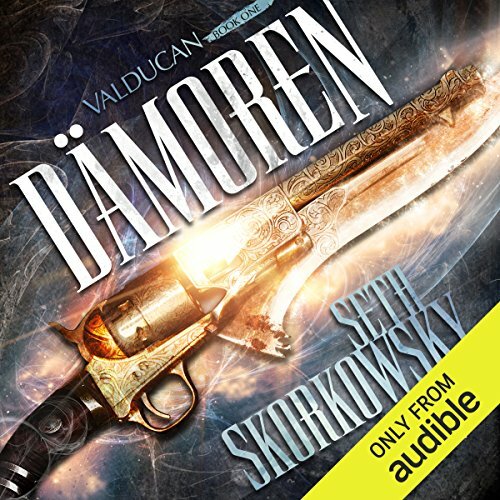 ©2014 Seth Skorkowsky (P)2014 Audible Inc.
What made the experience of listening to Damoren the most enjoyable? This was a solid book on all counts. The pacing was just right, it never felt that the story was languishing at any point - it always felt like the characters were moving towards a clear goal and there was always a sense of urgency. Character development was handled skillfully as well. There are a LOT of characters in this book since we're dealing with effectively, an entire secret order of demon hunters. Add to that each of these hunters possesses a holy demon-killing weapon which is also, in and of itself, a character. Naturally, it can be difficult to progress and develop personalities within this large "cast" without feeling like you're getting bogged down with exposition. However, without getting into a lot of backstory on each individual - we are still able to learn about each character through their interactions with each other and with their environment. I'm a sucker for good world-building, and myth-creation and I think Seth Skorkowsky does a fantastic job on both counts. The locales are easily visualized, and feel real and fleshed-out. The mythology surrounding the supernatural elements was an interesting twist on explaining the existence of monsters. The action in this book is fantastic! The battle scenes are well-paced and fantastic fun to read. Major battle scenes play out pretty much as you'd expect if you were watching an R-Rated action or horror film - read: it gets pretty graphic at times. So if you're not a fan of that stuff, then this book may not be for you - but I am, so five stars all around from me! Finally, R.C. 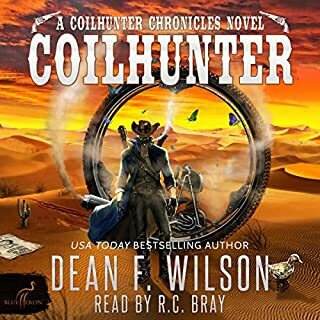 Bray is fast becoming one of my favorite narrators on Audible. The guy has a pretty good range, and does a decent job of inhabiting the different characters (although sometimes his accents can be a little unconvincing). Also, his deadpan delivery of some of the funnier lines and observations from characters injects some extra levity throughout the story. What other book might you compare Damoren to and why? This is the first book I've read in the urban fantasy genre, so I can't compare it to any other books. That said, the story, pacing, and mythology in Damoren were similar to that of Buffy the Vampire Slayer, Angel, Hellboy, and even League of Extraordinary Gentlemen. Honestly I don't know. At this point I pretty much just read books in "his voice" in my head now. The main character has an old-world pistol with the blade of a holy sword affixed to the barrel. If you think that image alone is even a little bit awesome - then you need to read this book. Would you listen to Damoren again? Why? Yes, I would listen to it again because the story is very intricate, layered, and I know I will get more out of it each time. It was so unique. I thought it was going to be like Supernatural, but it wasn't at all. It was a completely different dynamic. No, I hadn't heard him before, but I liked him very much. His characterizations were extremely well done. No, I prefer to listen to audio books in my car and over several days/weeks time. It gives me a chance to go back and listen to chapters over again, if I think I missed something. By far one of the best 'debut' novels I have heard or read in a very long time. Damoren is a rare treat, a wonderful sword-swinging story with a well-chosen narrator who never gets in the way of the words, but delivers a really solid performance of a book that needs little embellishment, only clarity and grace in delivery. This narrator, R. C. Bray, voiced every character, from the Englishman to Luiza, the lady with a sword, and even the samurai and voodoo priest, distinctly, making each one memorable. A fine performance. Damoren was a really good read! This book surprised me I didn't expected it to be as good as it was. This book will pull you in from the beginning and not let you go tell the end. I don't often write reviews but I wanted to give it four and a half stars but couldn't from my phone. I'm a truck driver that runs over night and enjoy my books on the road. This book kept me going the entire 10 hour hale. If you could sum up Damoren in three words, what would they be? Unique, action packed, a good listen. I compared it a lot to Monster Hunter Inc. but it's a lot better than that. He did a pretty solid job in the voice acting. Though his girl impersonation is a little poor, not bad though. Kind of, I usually listen to it during my 8 hour shift. I'm looking forward to the next book, the ending really got me intrigued about the origins of the weapons and all that fun stuff. This was a great book. I highly recomend it to anyone who likes books like Monster hunter inc. I'm a picky reader and have lots of unfinished books in my library that i stoped listening to because thay were too generic or had logical holes. This book is solid from start to finish with good charakters and action. Unlike monster hunter inc I found this to be darker and less "Good guys win the day". No spoilers but no one is safe. Expertly narrated by RC Bray. I did not want to take a break from listening and now I can't wait for the rest of the series. 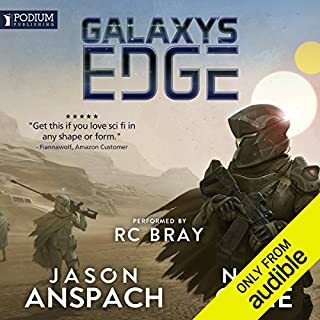 Where does Damoren rank among all the audiobooks you’ve listened to so far? I'd rank Damoren in the top ten percent of all audio books I've heard: the combination of Skorkowsy's propulsive prose and Bray's delivery is a perfect match. The action never stops, yet the characters come through as individuals. Kudos for these two for a terrific collaboration on a gripping story that is the beginning of a series yet has a satisfying conclusion all its own. What was one of the most memorable moments of Damoren? I fell in love as soon as Matt Hollis, current wielder of the holy weapon, Damoren, was introduced. Matt and his fellow demon-stalkers makes a believer out of me. Matt, the reckless loose cannon that can slash his way through any opposition is masterfully drawn, and his enemies will make you cringe. Although normally I'm not a fan of named weapons, in this story, each special weapon has its job, and a unique personality wielding it. This is the first audio-book I've heard that is narrated by R.C. Bray, and it won't be the last. Highly recommended for fans of paranormal adventure. Great narration is something that is very important to me when choosing a book. This one has an awesome narration in R.C. Bray and the story is solid. It's not 5 stars but a solid 4 stars. I'm looking forward to the next chapter. Skorkowsky is onto something with this series! It's one of the most captivating audio books I've sampled. Sure, but I ain't got time for that! When I bought this audiobook, I was a bit worried it'd get into religiosity - which can be a drag, since the book revolves around 'holy weapons', and all that. Skorkowsky avoids the trap and sticks strictly to the action - and is it ever a great ride. 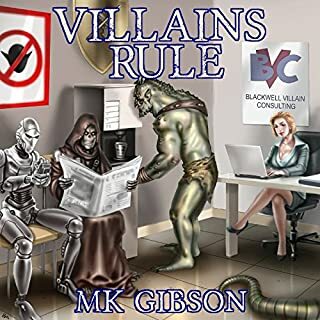 The sometimes oblivious and reluctant hero, characters that leap off the page, and spy movie action make for a fun audio book experience. Truly entertaining, and I must say I was bummed that Audible does not have any follow-ups in this series (perhaps they're not out yet?). But, I'll await Vol. 2 eagerly! I read that this book was like Supernatural (the TV show) and was sold. Didn't read the description properly, but did not care. This is a great book if you like this sort of thing. - At times a little complicated to follow but I don't mind that. - a real wholesome story where you can tell the author has thought about everything fully. Narration. 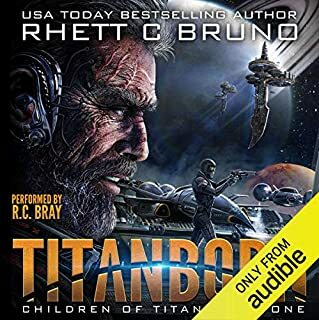 Love RC bray, I think he's one of the best narrator's out there and was a strong added influence in me wanting to listen to this book. If you haven't heard anything he's read before check him out, I cannot recommend The Martian enough (film does not do the book justice - film is almost offensive). However, I had to mark him down to a 4 star in this review as his English accent was the thing of nightmares. Being English myself I had to make a stand :). All in all great book produced very well. I would recommend this book to anyone who enjoys fantasy / sifi / monsters. As per usual verbal lullaby that is RC Bray makes an ok story eminently more listenable. There is nothing wrong with the story, it could use some character development, it is obviously setting up for a long money making chain of novels, but if you like TV like Supernatural you will enjoy it, if like me you enjoy RC Bray (and why wouldn't you he has the vocal range and ability that warms the soul to listen to) you will enjoy this. Just don't expect any awards for this book, just enjoy it's pulpy goodness. Story reminds me somewhat of the Devil May Cry games mixed in with historical occultism and great action! Quite enjoyable! If you like a good Human against Demon series this is a must. RC Bray again hits it out the park!! I got this book actually thinking it would be some sort of Sci fi story. Am I glad I came across it. The story is enthralling and for me at least unusual. The twists in the story are unexpected. A well written book the first I have read from this author. I am even now listening to the first chapter of the next book in the series. To the author I give thanks for storytelling of this quality. Would you try another book written by Seth Skorkowsky or narrated by R. C. Bray? I have and feel the same way; good stories but let down by the narrator. I know a lot of people rate R C Bray, and I bought this book on that basis, but I was sorely disappointed. 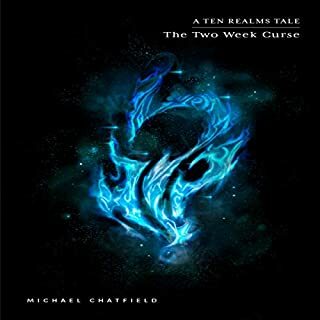 I wonder how much of this is due to an annoying American accent (not all are), or whether it's because, prior to listening to this, I thoroughly enjoyed the Kingkiller Chronicles. Rupert Degas, narrator of the Chronicles, is utterly superb and R C Bray pales in comparison. I almost switched this book off after just five minutes; R C Bray's reading made every word breathless and full of action, but with zero emotion and inflection; the opening scene became a blur of words. I also really struggled to tell characters apart, especially females, as all the voices are similar. Again, this could be because of the sterling characterisation and superlative voice acting by Rupert Degas. I made the mistake of listening to the Black Raven books after this trilogy; voices were so similar across the books that I sometimes got them mixed up between the two series! Seth Skorkowsky does write some good stories, and his books are definitely worth looking into, but perhaps read them, rather than listen. Amazing. 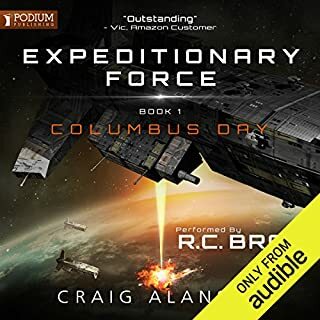 This is my first introduction into audiobooks and R.C Bray's narration was flat out amazing. Every character sprang to life in a cast of players as large as a blockbuster action movie. And that's what this book feels like. A cinematic, well paced action movie that oozes mythos and... authenticity. The world constructed in Seth's book has a rich and well thought history, characters have agency and backstories. You can really seperate each of the many characters and no one blends together in a blur. Not to give the plot away, but it's set in present day, involves an order of monster hunters and a grand ensemble of ghastly horrors. Vampires, werewolves, wendigos make an appearance. But they aren't your typical monster mash. The authors take on these creatures, what they are and how they operate is extremely unique. I've already bought the second book in this series and I really hope Seth will continue to write and release books in this world. he's gripped me as content creator on YouTube and now has me as an author. Rc bray has done it again with an outstanding performance. Seth skorkowsky is a fantastic writer can't wait to listen to the next book.